Just Julie B's Stampin' Space: Celebrating my Grad Girl! Today was my daughter's college graduation - So very proud of her!! Just to brag a little, she graduated in 3 1/2 years and had a 4.0 gpa in her major! She's going on to grad school for the next two years to get her master's degree in Speech and Language Pathology. So proud!! I made this card for her. Mainly I used punches to create the cap, and then made the tassel from the Baker's Twine. Pretty easy, and I didn't even need a specific graduation stamp set! I used the saying from the Perfectly Penned set. Her school colors are mostly red (and really blue too - but you never really see the blue on anything), so I kept it pretty simple with just the red, white and black layers! 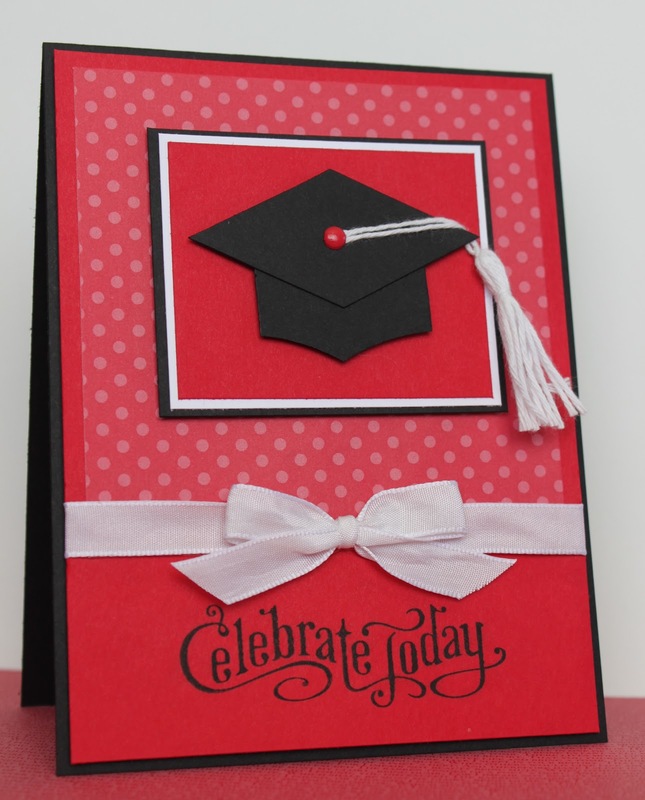 ** Click HERE for my quick tutorial on making the graduation cap! That's a great card! I could use that for my own son (and maybe his friends) for June 1st!! His high school colors are also red and blue with some white thrown in for good measure! Care to share how you made that cap? Julie what did you use for the bottom of the cap? Did you have to alter the square punchout for the top? Congrats to Jessie!!!! You must be so proud of her! Great card as well. GREAT card is it a A2 size card? Some Goodbyes for this Friday!